My son has been doing well and gaining more interest as my little kitchen helper. He's taking on a more interactive role by measuring, mixing and of course, taste testing along the way. With a growing vocabulary each day, he's all about announcing what he's doing too... and you'd think he's auditioning for a kiddie cooking show. In making this recipe, he did great naming off the ingredients as we added them to the bowl. He even stirred the batter with more gusto. But when his beloved blue beh behs needed to be folded into the batter, he lost it. He looked at me in horror as I took the batter bowl and proceeded to fold in the berries. According to him, blueberries had no place in a pancake batter. But little did he know what deliciousness was in store. I continued on with the pancake making from there because the blueberry police had a meltdown. That's when I leaned on my friend, Thomas the Train, to calm the little guy down. Suddenly, the tears stopped falling and he became so mesmerized by the screen in which Thomas was tooting his horn. And then the first few pancakes were ready. He tried one bite with hesitation. Then he took another bite. And another bite. Can you believe his polished off 3 pancakes? I had to cut him off at that point! Now my son understands that blueberries can be enjoyed in other ways - or at least, I hope he understands that. The good thing is this recipe makes quite a few and you can make them, cool and then wrap them up for the freezer so an easy breakfast on any given morning. Combine the flour, baking powder, and salt together in a bowl and whisk until well combined. In another bowl, mashed the banana with a fork and add the egg, milk, vanilla, and sugar. Whisk together with the fork until very well combined. Gently add the flour mixture to the banana mixture and stir until just combined. Fold in all the blueberries and set aside. Heat a nonstick skillet or flat griddle over medium low heat. Spray with cooking spray. Once the skillet is hot, pour about 1/4 cup of batter per pancake into the pan. Cook the pancake for 2 minutes or until the tops are covered with bubbles and edges look cooked. Carefully turn pancakes over; cook 2 more minutes or until bottoms are lightly browned. 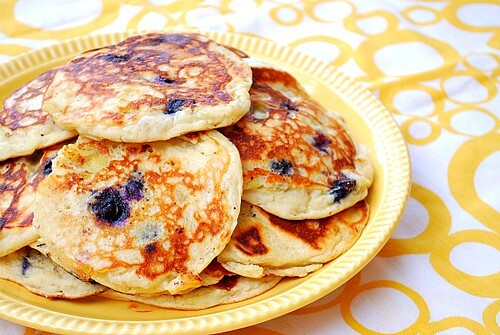 Very interesting pancake recipe! I love to make them because i can use so many combinations. 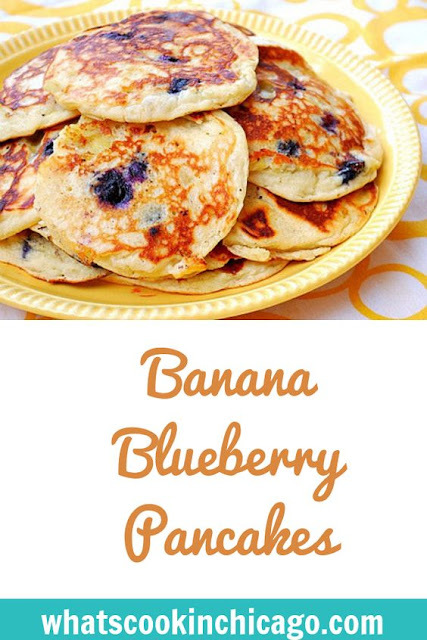 Just made this recipe this morning and they were the best pancakes ever! My kids loved it! Yummy recipe. I was all out of milk so subsituted it with light vanilla soy milk and made it for my grandkids. We absolutely loved it. I will definitely make again and again!! !